Mercedes-Benz revealed Research Frontiers Inc. (Nasdaq: REFR) as the developer of SPD-Smart light-control technology. The new Mercedes-Benz SLK will be the first large-scale series production vehicle to use Research Frontiers' patented SPD-Smart light-control technology, known as the Magic Sky Control panoramic glass roof. According to the news releases via Mercedes-Benz and Research Frontiers Inc., the Magic Sky Control feature allows drivers and passengers to change the tint of their car roof from dark to clear instantly with the press of a button. This increases passenger comfort and reduces air conditioning loads, thereby saving fuel and reducing CO2 emissions. The first Mercedes-Benz vehicle model to offer the Magic Sky Control glass roof as an option will be the new Mercedes-Benz SLK which debuted on January 29, 2011. 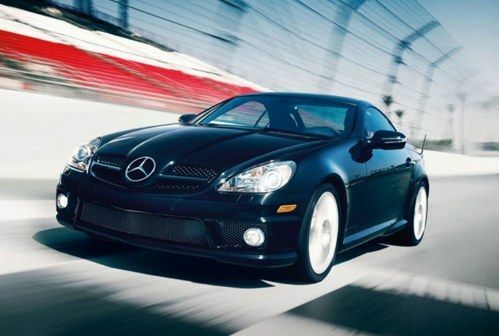 Look for the all-new 2012 SLK-Class to launch in summer 2011. Thanks to the wonders of nano-scale technology, users are allowed to instantly, precisely and uniformly control the shading of glass or plastic, either manually or automatically. Nanoparticles suspended in a film manufactured by Hitachi Chemical Company under license from Research Frontiers allow users to control, automatically or with the push of a button, the tint from between very dark (blocking over 99.5% of visible light, which is about 50-60 times darker than a typical sunroof) to about twice as clear as an ordinary sunroof. Mercedes-Benz put the Magic Sky Control SPD-SmartGlass roof through rigorous durability and performance testing in some of the most extreme conditions on earth. This included testing in the arctic cold of Scandinavia (with temperatures below -22ºF/-30ºC) and the blistering desert heat of Death Valley, California (with temperatures exceeding 122ºF/50ºC). The Magic Sky Control feature using SPD-Smart light-control technology allows drivers many benefits including the ability to create the open-air feeling of a roadster even when the weather does not permit one to open the roof. It also blocks over 99% of harmful UV radiation and substantially reduces heat inside the vehicle. For the record, Research Frontiers already holds about 500 patents and patent applications worldwide on its SPD-Smart light-control technology, and licenses it to 39 companies, including most of the world's leading automotive glass manufacturers. The Research Frontiers licensees involved with the production of the MAGIC SKY CONTROL roof for the SLK include Hitachi Chemical, which manufactures the SPD-Smart light-control film in Japan and has recently announced its capacity to manufacture 4.3 million square feet of SPD film per year. Automotive glass companies Nippon Sheet Glass in Japan and Pilkington in the UK and Germany then process and laminate Hitachi’s SPD film into the glass for the MAGIC SKY CONTROL roof. SPD Control Systems and Research Frontiers have jointly licensed intellectual property to Daimler AG regarding the electronics to control the SPD-SmartGlass in the Mercedes-Benz SLK and other vehicles. “SPD-Smart” and “SPD-SmartGlass” are trademarks of Research Frontiers Inc. “MAGIC SKY CONTROL” and “Mercedes-Benz” are trademarks of Daimler AG.